﻿Compounds found in purple potatoes may help kill colon cancer stem cells and limit the spread of the cancer, according to researchers. The researchers, who released their findings in the Journal of Nutritional Biochemistry, used a baked purple potato because potatoes are widely consumed and typically baked before they are consumed, especially in western countries. They wanted to make sure the vegetables maintained their anti-cancer properties even after cooking. 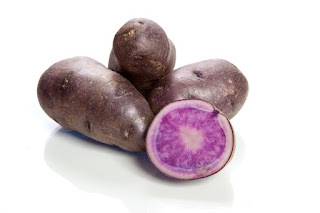 "Our earlier work and other research studies suggest that potatoes, including purple potatoes, contain resistant starch, which serves as a food for the gut bacteria, that the bacteria can covert to beneficial short-chain fatty acids such as butyric acid," the researchers said. "The butyric acid regulates immune function in the gut, suppresses chronic inflammation and may also help to cause cancer cells to self-destruct." Using evidenced-based foods as a proper cancer prevention strategy could complement current and future anti-cancer drug therapies. The researchers believe that foods could actually offer a healthier way to prevent cancer because they often have limited side effects compared to drug treatments. Purple potatoes could be potentially used in both primary and secondary prevention strategies for cancer. Based on material originally posted by Penn State.